Select a background from System Preferences. Desktop Pictures: These default backgrounds range from simple patterns to somewhat strange and ethereal flux shapes. Nature: These backgrounds feature scenic beauty. Plants: Close-up backgrounds of plant life. Black & White: Several truly stunning black-and-white backgrounds that look especially good on a widescreen display. Abstract: These backgrounds have even weirder twisting shapes in flux, this time with bright contrasting colors. Solid Colors: This is for those who desire a soothing solid shade. Pictures Folder: This displays the images saved in the active user’s Pictures folder. If you see something you like, click the thumbnail, and Mac OS X displays it in the well and automatically refreshes your background so that you can see what it looks like. Fill the screen: This can be used with a solid color to get uniform coverage. The original aspect ratio of the image is preserved, so it’s not stretched. Stretch the background to fit the Desktop: If your Desktop image is smaller than the Desktop acreage, this works, but be warned: If you try to stretch too small of an image over too large a Desktop, the pixilated result can be pretty frightening. The original aspect ratio of the image isn’t preserved, so you might end up with results that look like the funhouse mirrors at a carnival. Center the image on the Desktop: This is a good solution for Desktop images that are smaller than your resolution. Note that this pop-up menu appears only if the Desktop picture that you select isn’t one of the standard Apple images. All the pictures in the Apple Desktop Pictures, Nature, Abstract, and Solid Colors categories are scaled automatically to the size of your screen. To change your Desktop background on a regular basis, select the Change Picture check box and then choose the delay period from the corresponding pop-up menu. 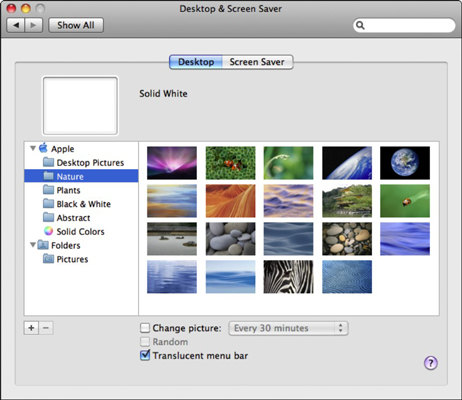 To display the images in random order, select the Random Order check box; otherwise, Mac OS X displays them in the order that they appear in the folder.